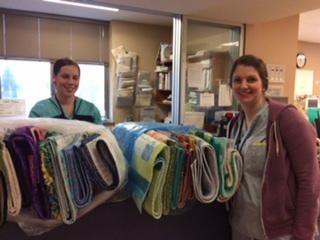 Since becoming Donations Coordinator, I have been stunned by the generosity and dedication of the guild members making so many gorgeous quilts for donation. 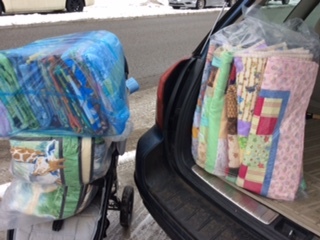 This past Thursday, Barb Segal and I delivered 71 quilts to the Neonatal Intensive Care Unit and 17 quilts to Tiny Bundles at the Food Bank. The staff who received the quilts were SO enthusiastic at the beauty and the sentiment! I currently have half a dozen quilts destined for RCMP cars. And not to forget Joanne Tjaden who has donated 101 toques which I will take to the Food Bank. All of us contribute what we can, but some members give so generously, that I am stunned. Thank you all. Lately, we have been having little “strip parties” where members cut donated fabric that is not currently in fashion into 2 1/2” strips and we will get them sewn into "1600" quilts. Coming up March 31, we will have our second sewing bee. This one will take place at Linda’s Quilt Shoppe where Jim has graciously offered us the classroom to make donation quilts. Our first quilt bee held in the Mission Hall was a fabulous success! We all had fun. It was wonderful to watch the sharing of ideas and stories which contributes to a stronger guild through developing friendships.